When it comes to furnace repair and installation services, no one is in the same league as Irish Heating and Air. For over 15 years we’ve been providing comprehensive heating repairs, installations, maintenance, and replacement services with the help of some of the best furnace technicians in the business. We believe in supporting every furnace repair and installation job with best in class customer service, starting with accurate pricing quotes and appointments, and ending with a follow up call to make sure you’re totally satisfied with the work. At Irish Heating and Air, we take your safety seriously – and we take our profession seriously. We don’t consider ourselves handymen or casual tinkerers, but rather certified professionals who hold your comfort, safety, and health in our hands with every job we undertake. 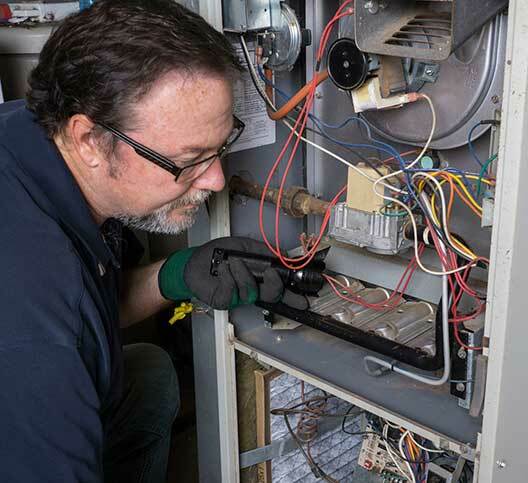 We want our customers to know that all of our furnace repairmen and furnace installers have undergone extensive training and on-the-job apprenticeships in order to hone in on their craft and fine-tune their repair techniques. Why Call Us For Your Heating Repair & Installation Needs? We only install quality heaters from trusted manufacturers like Mitsubishi and American Standard. So what are you waiting for? We’re confident that once you call us for your Tracy furnace replacement or repair needs, you won’t want to call anyone else. Our team is ready to help you pick out a new furnace or maintain your old one for years to come. How Does a Heater Work? Understanding how your heater works can help you to make wiser purchasing and repair decisions, so we love to educate our customers whenever possible. The air in your home drops below a certain temperature (set by your thermostat). The temperature drop triggers your furnace to turn on. Air and fuel intermingle and are ignited within the furnace. The product of this comingling, hot gas, flows through the heat exchanger and heats the air in the furnace. Air then circulates throughout your home via the ductwork, propelled by a fan. Excess exhaust is vented safely outside the home. One of the most common mistakes when purchasing a new furnace is to choose one that doesn’t have the right output for your living or working space. Bigger is definitely not always better, and a furnace that is too powerful and meant for a larger space will end up switching off and on frequently. This means that your furnace is suffering from more wear and tear than is needed, and its longevity will suffer as a consequence. A larger heater also will require more energy to run. A furnace that is too small isn’t much better. 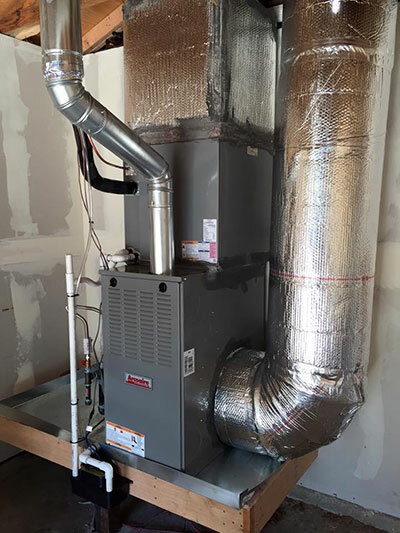 If your furnace does not have adequate output for your space, it will have to run constantly to warm up your home or office, which will also result in excessive energy consumption. Whenever you’re considering installing new heating equipment, make sure you speak with our Tracy furnace replacement team first. We’ll help you evaluate your options and pick the perfect heater for your needs, with zero obligation. 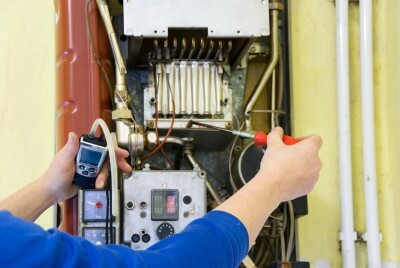 No matter what sort of heating system you have, our team can cover it. We’re even equipped to handle commercial HVAC repair and installation. At Irish Heating and Air, there’s no furnace problem that we can’t handle. We can maintain, repair, and replace parts of your current heater as needed, or help you choose an entirely new heating system for your home or business. Do you offer preventative furnace maintenance? Yes, and we recommend that our customers make use of our preventative furnace maintenance plans to keep their furnace working better for longer. Do you repair & install heat pumps? Yes, we can repair your old heat pump or install a brand new one for you. What are your preferred brands for new furnace installations? We prefer to install Mitsubishi and American Standard furnaces with 80-98.3% AFUE ratings. Where else do you offer heating repair and furnace installation? Our everyday service area includes Tracy, Mountain House, Turlock, Manteca, Modesto and Stockton. Do you service commercial systems? Absolutely. We install and maintain commercial heating and packaged HVAC systems of all types. Visit our commercial HVAC repair & installation page to learn more. We always recommend that you call a professional to repair your heater. Furnaces are dangerous machines that, if improperly handled, can leak toxic gases into your home. Carbon monoxide, for example, is colorless, odorless, and tasteless, but has disastrous health consequences. Call a professional furnace technician before you try fixing your furnace yourself. The most common reason that a furnace fails is because of a failure to change the air filter. Dirty and clogged air filters reduce air flow causing problems with the air handler and the air-to-fuel mix in the burn chamber. If your air filter has been clogged for a significant period of time, your entire system will need to be cleaned to return it to optimal heating condition. We offer a regular filter change service to prevent this type of issue in the future. Air flow issues can be caused by a clogged air filter, but they can also be caused by blockages in the ventilation system. These blockages can be fixed with a full ductwork cleaning and repair service. 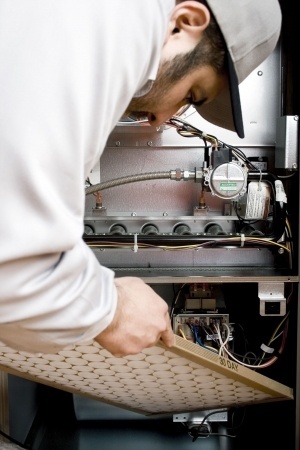 Problems in other areas of the furnace are generally caused by a lack of basic maintenance. 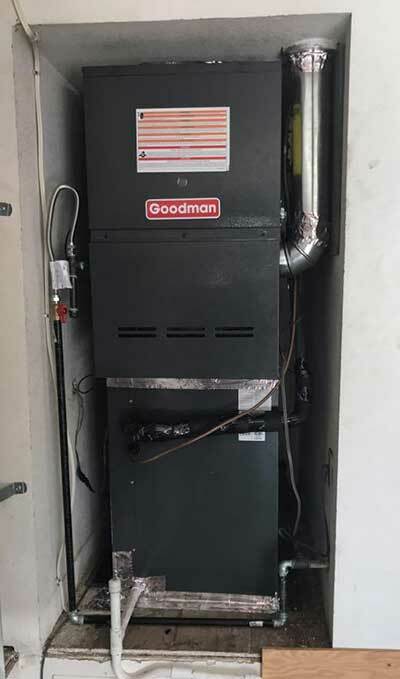 Electrical connections, plenum leaks, and heat exchanger issues can all be handled by our expert furnace technicians. Call the Tracy furnace repair professionals at Irish Heating and Air today and get have a cozy home tonight! Don’t Wait: Call Today For Quality Heating Repair & Installation in Tracy, CA! A poorly maintained heater will only cost you money and bring you grief, but a well maintained furnace will make your home cozy, comfortable, and habitable during the cold winter months. If you care about your family’s comfort and safety, then you need to call Irish Heating and Air for your Tracy heating repair and furnace installation needs ASAP! We’re standing by and reading to assist you any time, any day.